CatalystOne Solutions (www.catalystone.com) is a Norwegian software company with a strong corporate culture founded on collaboration and sense of family – both for its employees and customers. Transparency in management decision making, high employee autonomy, and community are three important factors that have contributed to CatalystOne Solutions’ Great Place to Work award. “This is all thanks to our employees! This award is proof that we have succeeded in protecting our culture and our focus on each individual employee throughout a year of more than 40% company growth”, said Camilla Hydén, VP of People & Culture. “As a supplier of HR systems, we have a wealth of talented and engaged employees who care about creating the world’s best workplace for both our very own CatalystOne family and our customers. We certainly try to practice what we preach”. The Great Place to Work certifications are a priority at CatalystOne, as we are adamant that the success of the company’s growth strategy is highly dependent on a strong company culture and commitment to our values. CatalystOne’s Swedish branch is also certified, and plans are underway for the departments in India and Denmark. CatalystOne Solutions is a rapidly growing SaaS company with over 200 passionate employees who all work towards a common goal: enabling organisations to build a thriving workplace. CatalystOne specializes in software and services for digitization of HR and management processes, along with creating excellent relations between HR, employees, and managers. We are a leading HCM (Human Capital Management) software supplier in the Nordics and offer user-friendly solutions supporting all HR processes, from recruitment to end of employment. We have offices in Stockholm, Copenhagen, Oslo, Sandefjord, along with an R&D center in Chandigarh, India. Great Place to Work (GPTW) is the global leader of development, preservation and recognition of company cultures that are defined by a high level of trust. GPTW is a global organization and has since 1998 conducted their Great Place to Work surveys in over 50 countries. 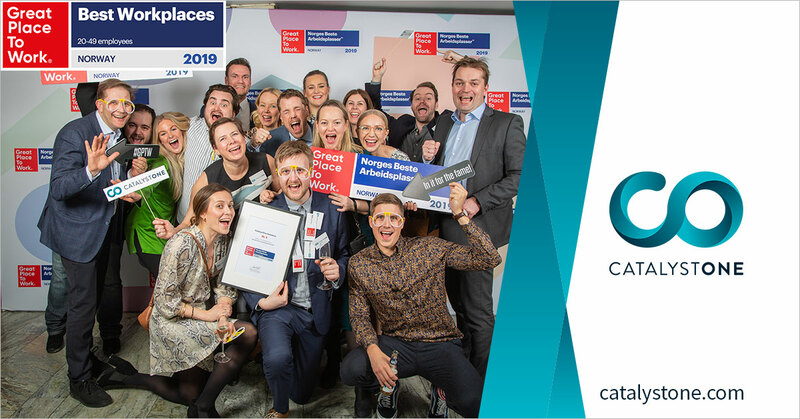 For the 16th year in a row, GPTW awarded Norway’s best workplaces, with over 217 companies and 30 203 employees participating in the surveys. Each company is evaluated through analysing anonymous answers to more than 50 question in GPTW’s Trust-Index survey, combined with an analysis of the companies’ corporate culture and practices that are evaluated through GPTW’s culture analysis – Culture Audit. Jannik Krohn Falck is the CEO for Norway and point of contact for media inquiries.